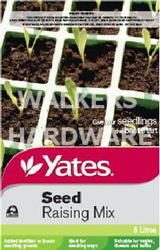 Yates Seed Raising quality mix is specially formulated for raising seeds. The mix has added fertiliser to stimulate growth to give your seedlings the best start. The mix is suitable for vegetables, flowers and herbs and can also be used for propagation of cuttings. Enriched with a fine grade of Nutricote to feed seedlings and cuttings until they are planted out.